When the sun goes down at the pool, don’t turn on blinding light. Night time is the right time to kick back by your pool and forget about the day. As dusk turns to night, if the only lights you have to illuminate the pool area are submerged your experience may be somewhat less than relaxing. 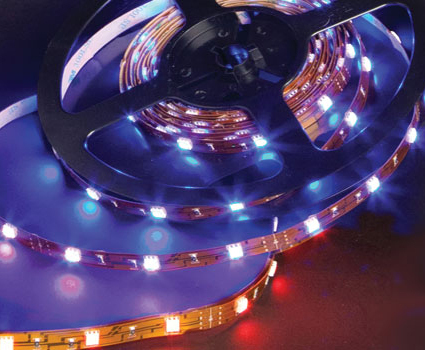 Submerged lights may be fitted with as much as 400 watt bulbs that can create a blinding effect. It may be annoying enough to drive you back indoors for relief. 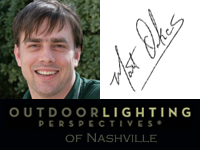 Outdoor Lighting Perspectives loves to work with pool lighting because it’s very satisfying to design an ambient lighting system that turns your outdoor pool into an evening oasis when the sun goes down. 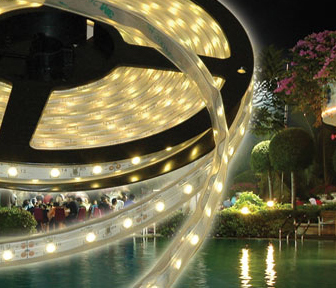 The deck area is lit and the water can be seen well without blinding your eyes. This is done by the use of recessed low voltage lighting marking the side of pathways and post lights on steps and columns. 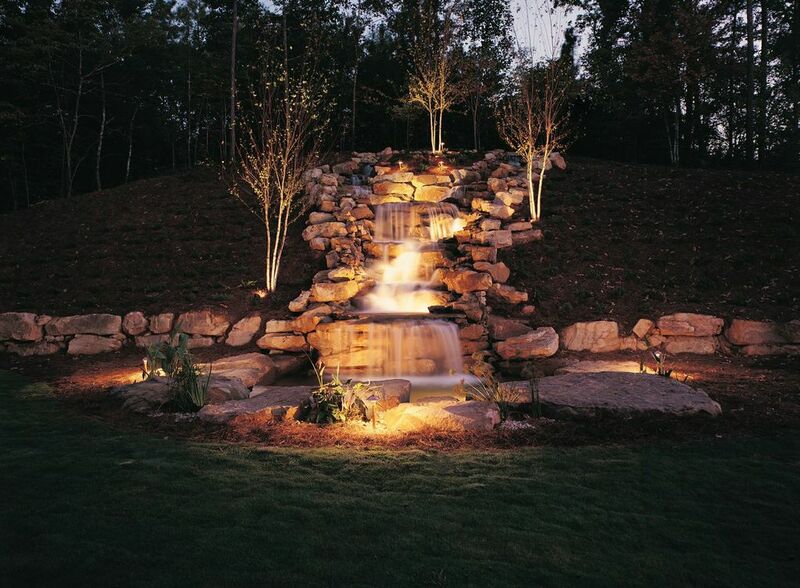 If your pool has a waterfall, we can provide a stunning effect with underwater lights. 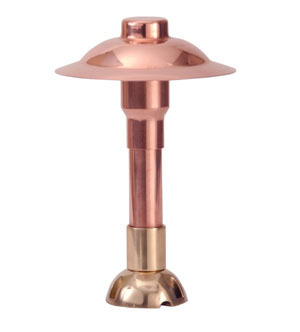 Copper 6" tiered light for pool decks. 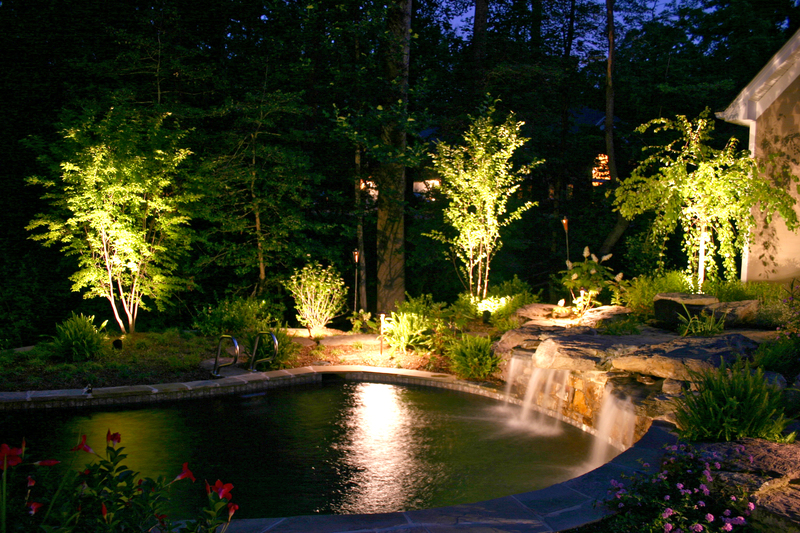 We offer many different styles of lighting to make your pool area into the centerpiece of your outdoor living space. Wood decks or the concrete decking around the pool are perfect places to recess copper wall/deck lights that will cast a low flood of light using either quartz or LED bulbs. 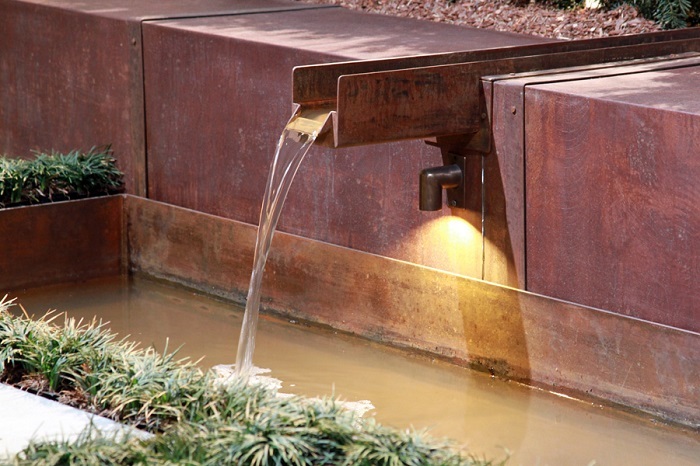 Pathways can be lit with 6” pier mounted copper lights which also work well on retaining walls and bench seating. All of these lights are made of high-quality copper that will take on a lovely patina finish as they weather outside in the elements. All of this will serve to enhance the beauty of your pool retreat. A nice light for a wall is our brass ‘half-moon’ sconce that creates a rich ambient light from walls and deck posts. 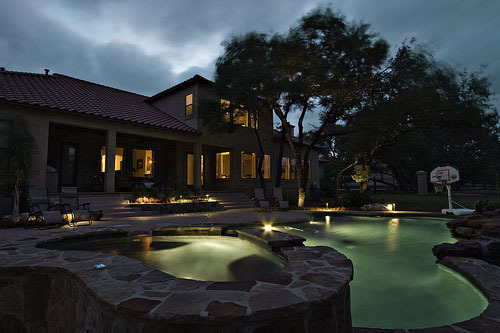 Post lights help to light the way on steps and provide that extra safety factor we look for around the pool. 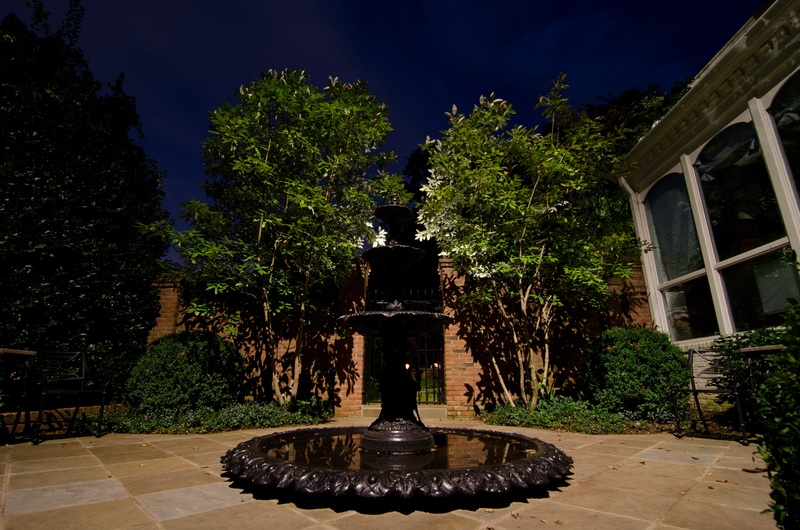 If you want to create a spectacular effect with your pool waterfall, the large cast brass pond light will do the trick. 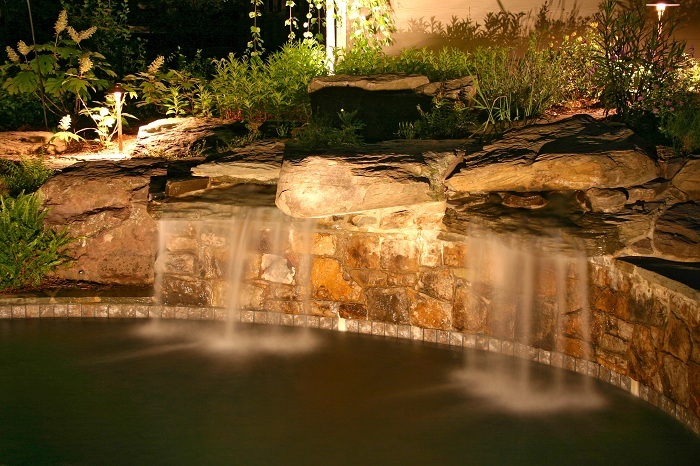 Create shimmering effects behind the waterfall that will surely be the showcase of your pool area. 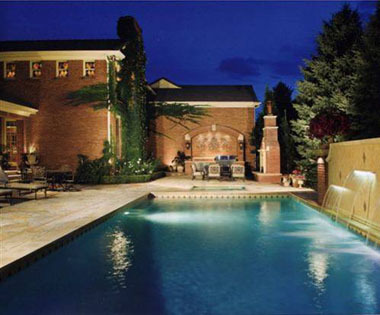 We can design pool lighting for your new pool or retrofit your current one. Our goal is to give you a natural lighting effect around your pool area so when you kick back at the end of the day it truly will be a relaxing experience. Contact us for a free quote, and remember, with the advent of warm weather comes mosquitoes. Where there is water, there will be mosquitoes. Contact us for help.